Madhuban Mitra and Manas Bhattacharya are based in Kolkata, India and work together as an artist duo, primarily with photography and video. Madhuban studied English Literature and holds a Ph.D in Cultural Studies. Manas studied cinematography after completing his M.A. in Comparative Literature. Their work engages with time and memory, transience and detritus, notions of the archive and the catalogue, the original and the copy, employing and often combining documentary and fiction, analogue and digital, and images made and found. Some of their key interests are the small histories of photography and cinema, industry and labour, the city and the urban imaginary. 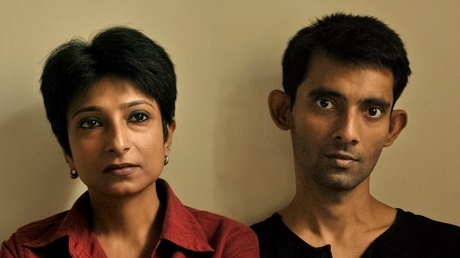 They received the Skoda Breakthrough Artist Award for the best debut solo show in India in 2011. Other awards include the Embarrat Award from Museo Trepat, Tarrega, Spain and a grant from Fondazione MAST, Bologna, Italy as part of the GD4PhotoArt Award 2014-15 to produce their most recent photographic project. Some of their recent solo and group exhibitions include Afterimage at Photoink, New Delhi, India; Postdate: Photography and Inherited History in India in the San Jose Museum of Art, California and Ulrich Museum of Art, Kansas, USA; and The Great Machine II at Museo Trepat, Spain; GD4PhotoArt/Foto Industria at MAST, Bologna; Photoink at Gallery SKE, Bangalore; and Imagined Futures, Reconstructed Pasts at Bikaner House/Anant Art, New Delhi, India.